2Program of Civil Engineering, COPPE, Federal University of Rio e Janeiro, Rio de Janeiro, Brazil. Received October 20th, 2010; revised March 15th, 2011; accepted April 25th, 2011.
almost no environmental protection infrastructure. 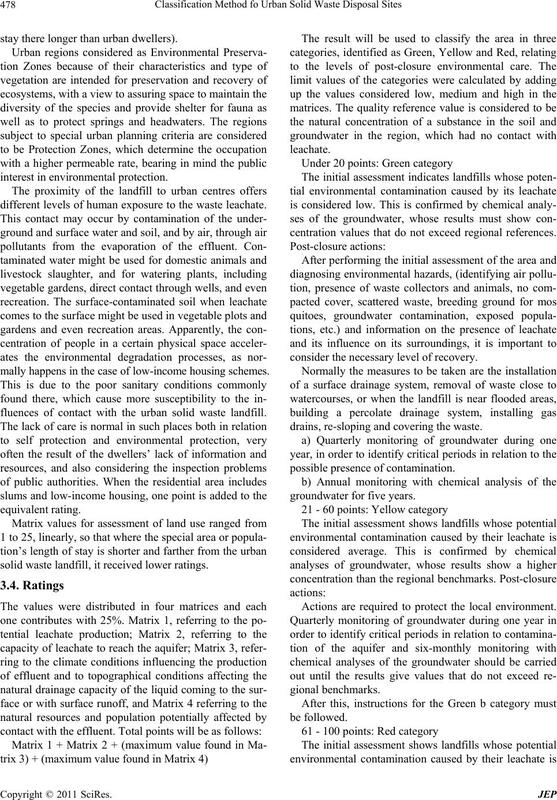 ing potential hazards of environmental degradation. waste and the dead-load of the waste itself. occupation, associated with a public utility, be prepared. ing the deat h of 231 people. contaminated areas and waste disposal sites. last two stages with regard to preparation. standing of the processes of generating mass movements. agnose, categorize and map the risk status. man health, property or the environment. forms of material between them. lives, destruction of homes, housing the homeless, etc. movement for the associated socio economic losses. contamination to people and natural resources. zone over the gr oundwater level). ganic waste mat t e r.
tors of potential environmental and human health h azards. taken on its closure and subsequent monitoring. source, pathways and exposure of subj ects. inorganic ions (heavy metals, chloride, sulphate, etc.). (IPT/Cempre, 2000, and Andreotolla et al., 1997). vanced, thereby reducing leachate production. 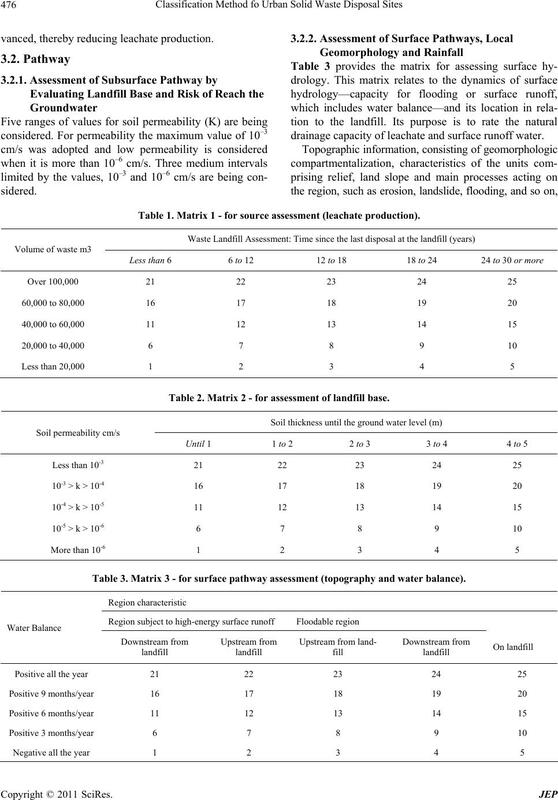 drainage capacity of leachate and surface runoff water. Table 1. 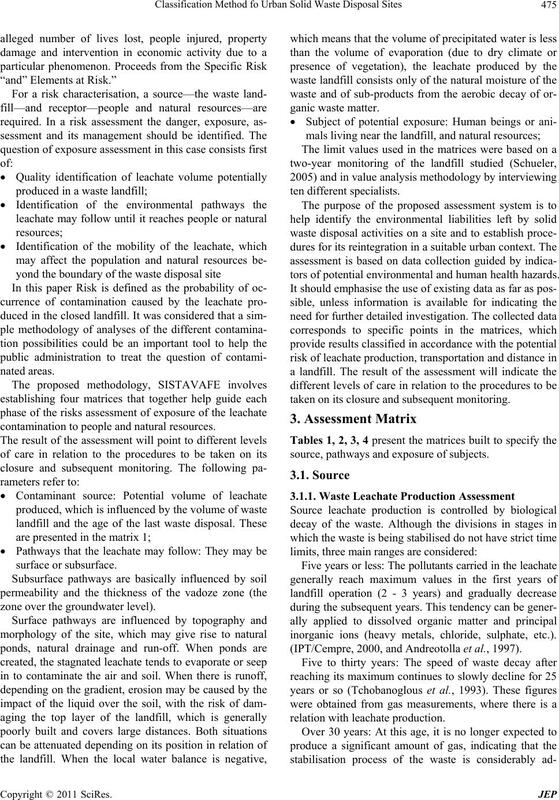 Matrix 1 - for source assessment (leachate production). Table 2. 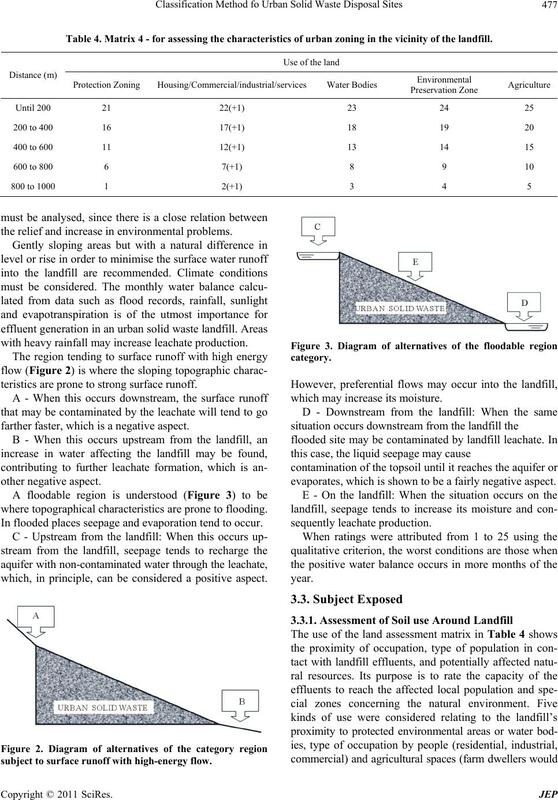 Matrix 2 - for assessment of landfill base. Table 3. Matrix 3 - for surface pathway assessment (topography and water balance). Table 4. Matrix 4 - for assessing the characteristics of urban zoning in the vicinity of the landfill. the relief and increase in environmental proble ms.
with heavy rainfall may increase leachate production. teristics are prone to strong surface runoff. farther faster, which is a negative aspect. where topographical characteristics are prone to flooding. In flooded places seepage and evaporation tend to occur. which, in principle, can be considered a positive aspect. subject to surface runoff with high-energy flow. which may increase its moisture. evaporates, which is shown to be a fairly negative aspect. stay there longer than urb an dweller s ). different levels of human exposure to the waste leachate. mally happens in the case of low-income housing schemes. 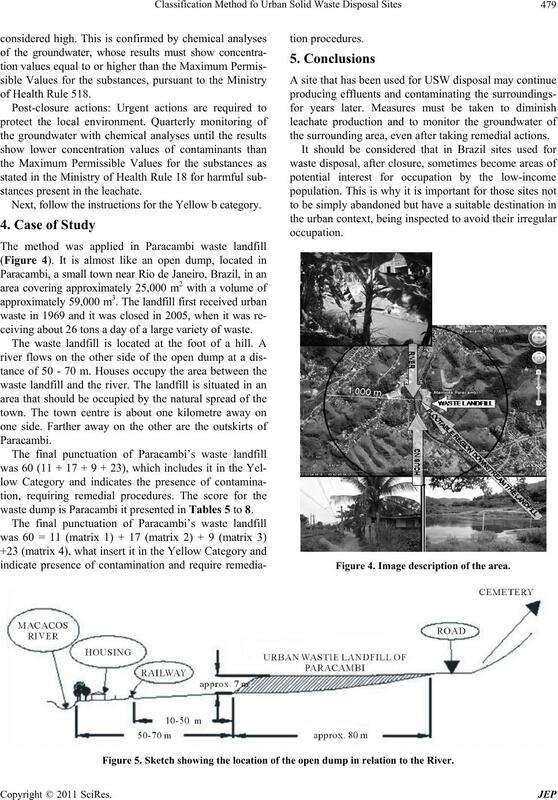 fluences of contact with the urban solid waste landfill. solid waste landfill, it received lower ratings. centration values that do not exceed regional references. consider the necessary level of recovery. drains, re-sloping and covering the waste. Actions are required to protect the local environment. the surrounding area, even after taking remedial actions. stances present in the leachate. Next, follow the instructions for the Yellow b category. ceiving about 26 tons a day of a large variety of waste. 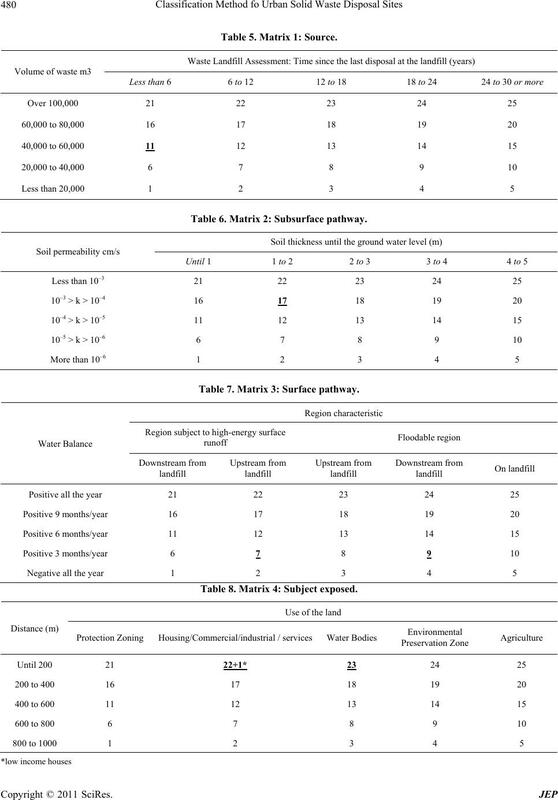 waste dump is Paracambi it presented in Tables 5 to 8.
indicate presence of contamination and require remedia- Figure 4. Image description of the area. Figure 5. Sketch showing the location of the open dump in relation to the River. Table 5. Matrix 1: Source. Table 6. Matrix 2: Subsurface pathway. Table 7. Matrix 3: Surface pathway. Table 8. 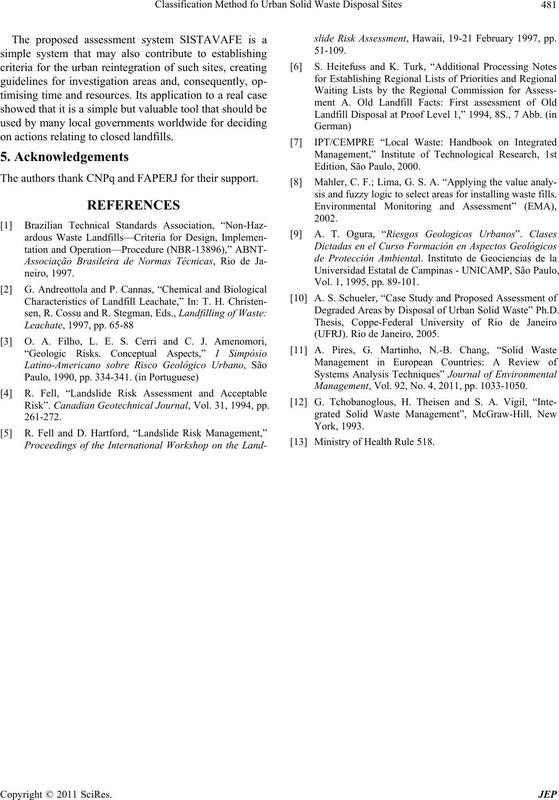 Matrix 4: Subject expose d.
on actions relating to closed landfills. The authors thank CNPq and FAPERJ for their support. Risk”. Canadian Geotechnical Journal, Vol. 31, 1994, pp. 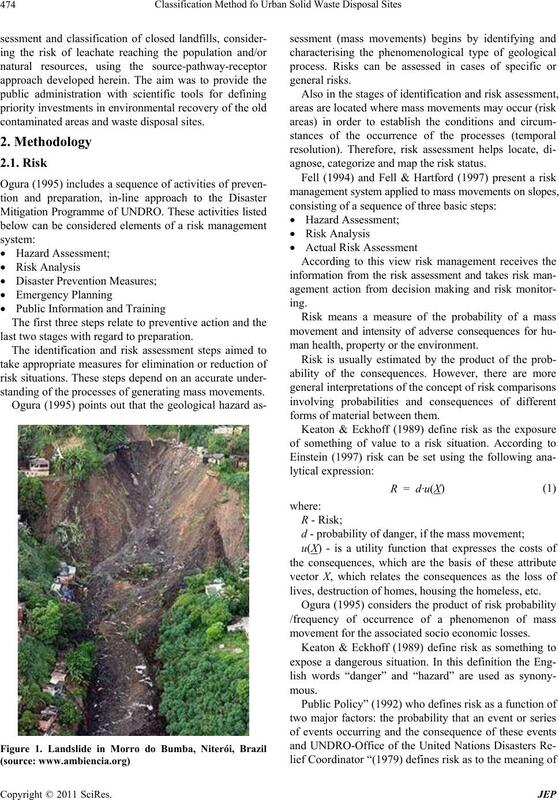 slide Risk Assessment, Hawaii, 19-21 February 1997, pp. sis and fuzzy logic to select areas for installing waste fills. Vol. 1, 1995, pp. 89-101. 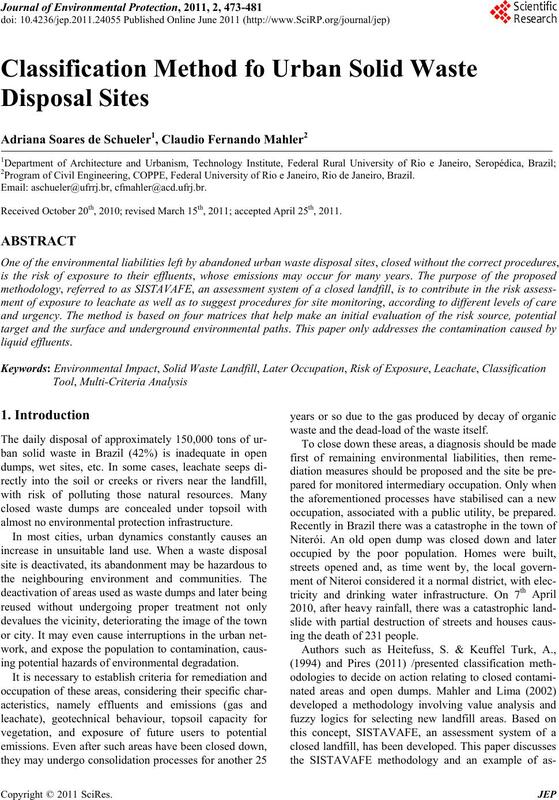 Degraded Areas by Disposal of Urban Solid Waste” Ph.D.
(UFRJ). Rio de Janeiro, 2005. Management, Vol. 92, No. 4, 2011, pp. 1033-1050. Ministry of Health Rule 518.